This has got to be my favorite pallet project ever. Wanna know why? Cause it’s the easiest I’ve ever seen. By. far. I mean, really, have you ever tried to take one of those things apart? It’s nearly impossible. I’ve had a few really good old ones leaning against the garage for the last 6 months or so, but I just couldn’t stand tearing them apart. All those rusty, twisted nails? No thank you. The best thing about this little “project” (if you can call it that), is that you don’t need to take it apart at all! In fact, if there are a few boards loose from you trying to pull them out, go ahead and get a hammer and pound them back into place. If you have a really old one with a few boards missing, that’ll work just fine too! 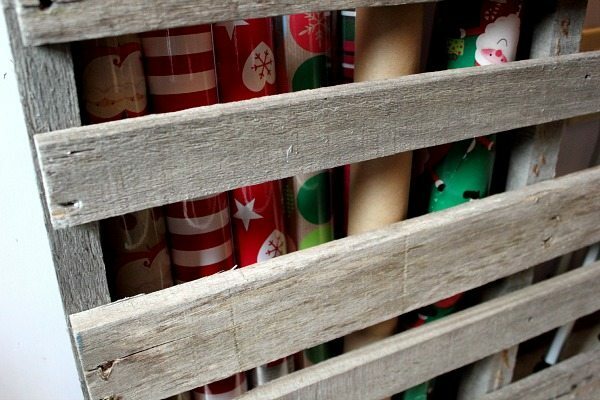 All you’ll need to do is take it into whatever room you store your wrapping paper in, stand it up next to the wall, and you have a perfect little “bin” to hold all your rolls of wrapping paper. And it only takes up about 5″ of space off the wall. 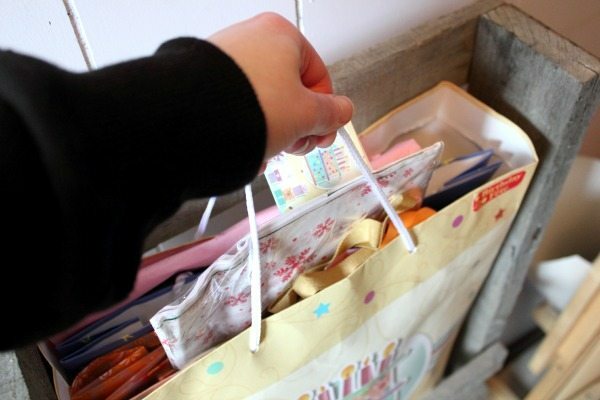 I keep rolls of paper in one side and a big gift bag filled with other gift bags and tissue paper in the other side. You could even secure it to the wall if you wanted to, but I found it wasn’t necessary at all for me. I’ve been looking for a good way to store my gift wrap for years and finally I’ve found something that looks good (if you love all that rustic wood, and I do), and is totally functional. Even though the only rolls of paper I usually have on hand are for Christmas, I think they’re pretty and I like to keep them out in plain view all year so I can enjoy their cuteness. Yes, this back hall/storage area still has weird purpley paint and dark brown baseboards, but that doesn’t mean I can’t have cute storage. I wouldn’t be opposed to having a whole wall of pallet storage. It’s the easiest “project” I’ve ever done! If you have any pallets left over from all of those amazing pallet wood projects I’ve seen out there, give it a try! I hope it comes in handy! Make Your Own Custom Storage Basket! This is brilliant. I can also see it in the garage for baseball bats & hockey sticks.. fishing nets & the like. I had to pin this!! Very handy. Such a great idea! I have a ton of wrapping paper and paper bags and have been trying to figure out something more accessible for me. Now I just have to find a pallet or 2! I love the idea of using pallets in different ways like this. It is a great use of something that probably would have just been burnt. Although, I have heard that they are treated with dangerous chemicals and should only be used outdoors. Has anyone else heard this? Just wondering. Great blog! Thanks for sharing. Tip like this I was trying to imitate. Often I don’t realize that we can easily organize my paper bags in interesting ways. Thanks for sharing..
Glad to hear i’m not the only one with pallets leaning up against the garage outside! My husband will be thrilled when I drag them in for this, LOL! Thanks for posting!